This is a very simple PowerShell script to export your Lync/Skype for Business holiday sets in Response Groups. The script will parse your pool name (assuming there is only one), and will export each holiday set as a separate .csv file in the root of your C: drive. Lync calls fail with long post-dial delay? Check the Edge! 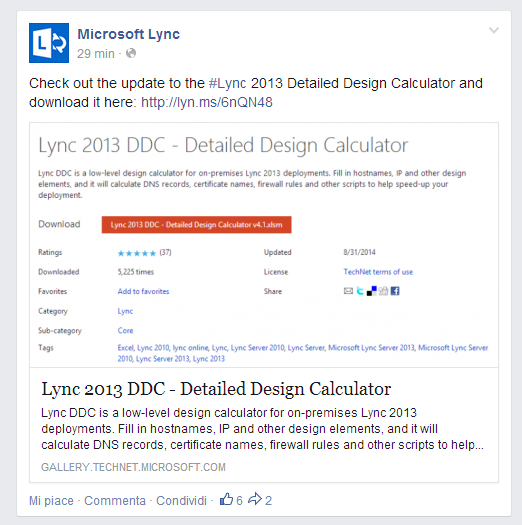 Lync 2013 Redundant deployment. 3-node Enterprise pool. 2-node Edge servers. Public addresses on external interfaces. All OS are Windows Server 2012 R2. All Lync servers at latest CU as of February 2015. All infrastructure virtualised on VMware ESX 5.5. Lync and PSTN calls suddenly could not be connected by external or internal endpoints. Clients received a call, call is answered, client hangs on "connecting..." state for some seconds, and then call is dropped. Along with issue above, calls suddenly took a long time to be initiated (long post-dial delay). Whilst up to 2-3 "beeps" should be considered as normal, we experienced up to 8. The sneaky nature of the issue was no apparent recurrence pattern. On average, we experienced the issue 4 times in around 3 weeks. Worth nothing saying, it was a hugely disruptive problem affecting about 10,000 users. Experienced issue was identical word-by-word, to the one described in this thread. All fixes suggested in the forum attempted without success. After ensuring 1) and 2) were correct, we concentrated on MRAS; traces and Lync reports indeed provided evidence something was not quite right (candidates not exchanged, timeout on contacting MRAS resulting in endpoint being unable to obtain MRAS token). After considerable digging, we found out the issue was triggered by two drivers: vShield Endpoint Thin Agent driver (vsepflt.sys) and vShield Endpoint TDI Manager driver (vnetflt.sys), both interacting at the network layer. Conclusive proof was provided by Microsoft PSS, by analysing a memory dump taken during a failure and Edge MRAS in hanging state (service stopping….). VMware vShield Endpoint is required to manage anti-virus and anti-malware policies for virtualized environments. vShield Endpoint strengthens virtualization security with enhanced endpoint protection by offloading AV processing to a secure virtual appliance supplied by VMware partners. All servers in the deployment featured a file-level AV scanning, and the drivers were required as an agentless communication component between the virtual machines and VMware hosts. such drivers were already known to cause stability issues, including BSOD (check this and this other post. Besides, they are not certified by Microsoft (at least, until the tested build). Although we thought we were running a version fixing the issues described in the articles above, it seemed we hit a different type of bug which VMware fixed at a later date through an ad-hoc patch. Our only other quick fix was to uninstall the drivers from the Lync servers completely. Simply disabling AV scanning or disabling the drivers did not help. Confirming their full compatibility will definitely save you some headaches. I have experienced very similar issues on another deployment, this time, with McAfee antivirus. On that occasion, the trigger was the FireTDI driver (a host intrusion detection component). I have recently come across an interesting challenge. A customer asked for several Polycom CX600 phones to be provisioned with a Lync Client policy enabling hotdesking and a long hotdesking timeout. I experienced a quite unexpected behaviour, which I though It would worth sharing. A Common Area Phone (CAP for brevity) is a special-purpose Lync phone setup, that is not associated with a specific user account, therefore with the user-specific set of policies and phone number. A CAP is usually placed in public areas like lobbies, restaurants, public-access meeting rooms, etc., CAPs use a specific contact object which has the usual set of policies (dial plan, voice policy, client policy, conferencing policy, etc.) associated. CAPs are signed in through PIN authentication, then they are usually left alone and will stay signed in permanently. Because CAPs are easily accessible "by design", it is common practice to provide them with a very restrictive voice policy, only allowing specific numbers to be called (e.g. internal company numbers or extensions, help desk, internal security, emergency numbers, etc.). A CAP may or may not be also configured as a hotdesking phone. This is determined by the EnableHotdesking ($true) parameter in the client policy you assign to the CAP contact object (and not to the user). When a CAP has hotdesking enabled, a user may "override" the CAP account, sign in to a CAP with own user account, and use Lync Server features and their own user profile settings. Because user accounts are usually provisioned with additional calling capabilities (mobile phones, international numbers, etc.) through voice policies, security is a concern: if a user steps away from the hotdesk, the phone may be available to others for call capabilities they shouldn't have access to. To overcome this, Lync client policy provides a mechanism to sign out the hotdesk user from the phone after some inactivity, and sign the CAP account back in. This is governed by the HotDeskingTimeOut parameter in the Lync client policy. The default value is 5 minutes, consistently with the security implications. My customer works in a higher security environment, so, enhanced restrictions on CAPs were not a concern. No CAPs are accessible by non trusted people. There are several common areas and conference rooms frequently used as hotdesking spaces. Several CAPs are available. Users wish to be able to sign in as hotdesking users on CAPs in the morning, and stay signed in at least until the end of business hours, so I was asked to configure a 12-hour timeout. It worth noticing that the HotDeskingTimeout parameters does accept values up to 23:59:59. Theoretically, the object type(System.TimeSpan) even accepts values bigger than 24 hours. This upper limit is also consistent with some public sources. It should also be noted that TechNet does not provide any information about the maximum configurable value. I was reported that all users signed it as hotdesk users on CAPs were kicked out after about 1 hour, and the phone reverted back to the CAP account. First off, I ruled out a bug in firmware. The issue was experienced on several LPE builds, including the latest one at the time of writing (7577.4457). Phone logs revealed something interesting, when playing around with different HotDeskingTimeout values. It appears the highest honoured timeout value is 10 hours (600 minutes). Any value beyond that is either ignored or misinterpreted by the phone, and a fallback value of 60 minutes is used instead. Pulling out LPE logs is not exactly a straighforward task. I recommend this excellent tool by Andrew Morpeth to streamline the process. I have only tested on Polycom CX600 phones and cannot confirm if other Common Area Phones would show the same behaviour.